The goal of the Club is to present a wide variety of programs, that appeal to photographers of all skill levels. This years programs include how-to demonstrations, both in-house and tri-club competitions as well as lectures by local and regional photography professionals. We generally meet twice a month on the second and fourth Thursdays at 7:00 PM. Come at 6:30 for our Mentors Table, and socializing. Our meeting location is Jenkins Hall at the West Parish of Barnstable. For the holiday months of November and December, check the calendar page for specific dates, as these may vary from the normal schedule. Guests are welcome, check the Membership Page for information on joining. If you are a member of the Cape Cod Art Center, you may join the camera club. You will need to create an account on this web site to receive camera club emails and participate in our competitions. Sharing Images A large part of our program is devoted to sharing images in a non-competitive environment. During the coarse of the year, we host image critiques by a panel of CCAC Camera Club master members discussing how images might be improved. Members of all skill levels are invited to bring in images to share and discuss. This is an excellent way to get feedback on how to improve your images, especially for upcoming competitions. Exhibits Our camera club has the unique advantage of being part of an established art association. 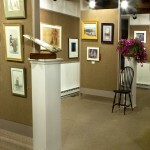 You may enter the four Open-Juried Exhibits the Cape Cod Art Center offers and if accepted may exhibit and sell your work. There will be many other outside venue exhibits that the CCAC and the Camera Club will set up for the display of your work. NECCC Competitions The club participates in the New England Camera Club Counsel interclub Electronic Photograph competitions. This is an interclub competition between over 70 clubs throughout New England. This gives members experience with more judges and gives their images more exposure. There are three competitions each year, Fall, Winter and Spring, each having two classes, Nature and PIctorial. Nature must meet the PSA rules, which requires no hand of man, i.e. no indications of human intervention, like man made items, cultivated plants, pruned plants, etc. Pictorial is an open category. See our NECCC page in the competitions area for more details. Note also that you can only submit from one camera club. If you are a member of multiple camera clubs, you must pick one and let the competition managers at each club know if they may or may not use your images.